This book shares with the reader the value of establishing a divorce recovery ministry while also offering practical insights on establishing your own unique church-affiliated program. 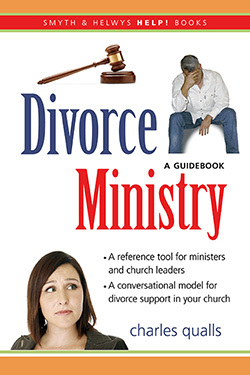 Whether you are working individually with one divorced person or leading a large group, Divorce Ministry: A Guidebook provides helpful resources to guide you through the emotional and relational issues divorced people often encounter. • Why would a church offer divorce recovery? Dr. Qualls’s passion for a ministry of divorce recovery is obvious in this thoughtfully written book. As a pastoral counselor, I am especially grateful for his educated devotion to this timely topic, which includes a theological discussion of the importance of embracing others. He includes both sound/experiential information and compassionate insight that is of great value to the reader. Charles Qualls has written an excellent guide and road map for anyone interested in building a divorce recovery ministry in churches and communities. His vast experience in this field makes him highly qualified to help anyone who has a heart for healing the hurts of those affected by divorce.